Hey everyone! We haven't had time to write up a full new post this week, because we have been busily painting our behinds off for our upcoming split show! This is going to be our first feature show and we're really excited about it. Seal is preparing a whole new slew of amazing other-worldly landscape paintings, and Monkey is preparing an interactive narrative to accompany his paintings. It should be a really fun evening! 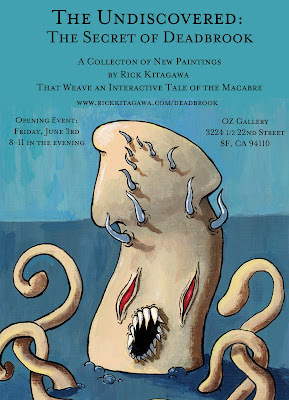 The show opens on Friday, June 3rd from 8pm-11pm at Oz Gallery, located at 3224 1/2 22nd Street (between Bartlett and Mission). We're super excited and we hope to see you there! 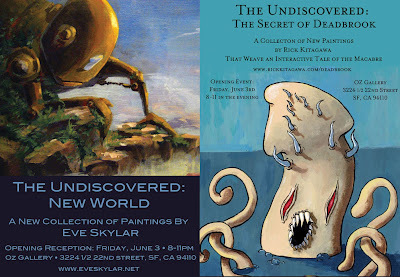 The Undiscovered is a two-person show made up of two parts: "New World", a collection of new paintings by Eve Skylar, and "The Secret of Deadbrook," new paintings by Rick Kitagawa that weave an interactive tale of the macabre. 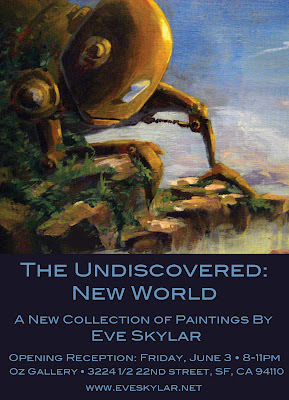 "New World' will explore a journey into the uncharted territory of the fantastic landscapes that inhabit Eve Skylar's mind. From steampunk junkyard swamps to soaring new heights and forgotten robots, come explore the realm of the New World. "The Secret of Deadbrook" is an interactive horror murder mystery told through paintings and their accompanying narratives. Children have been disappearing in the town of Deadbrook, and when a witness comes forward concerning the most recent disappearance, it's up to you to unearth the sinister secrets of Deadbrook. All you will need to solve the mystery will be at your fingertips - can you figure out who is killing the children before it's too late? If you can, enter your guess and you'll have a chance to win original art!